Amelia woke-up earlier, got dressed and then had to wait to walk to school. She had her new outfit on (courtesy of Nana) and a new backpack (thanks to Grammie). 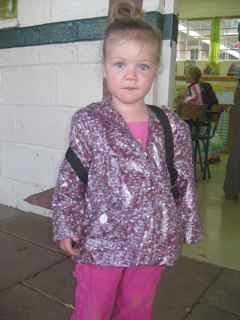 Meredith also put on her coat and backpack and thought she would be going to school as well. I think the day was a success. Amelia's been talking about school since coming home, and looks forward to collecting the "four things to share about me" for Friday. I think the biggest problem is going to be settling on only 4 things! This was also an exciting day for me as Dr. Sharon Morad (OB) began working and we will be together the next year. We've got a busy day lined-up for tomorrow and I'm grateful for her help! The terms iatrogenesis and iatrogenic artifact refer to adverse effects or complications caused by or resulting from medical treatment or advice. Examples are a wrong dose medicine, surgical instrument left inside the body cavity, or wrong leg amputation. Thankfully in dentistry iatrogenic events are far less spectacular but still cause plenty of headaches and unplanned outcomes. 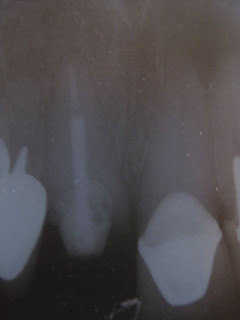 The specialty of endodontics presents many opportunities for "misadventures" as a professor once told me. Indeed this occurred to me as I was completing RCT on a staff member at Kijabe Hospital. For no apparent reason on a non-curved canal, with straight-line access, a Tulsa Rotary 40X.08 separated. 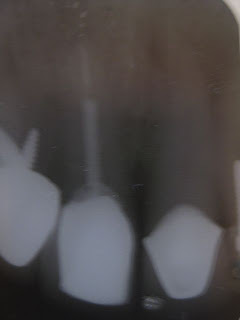 The radiograph shows the file trapped and short 4 mm of the apex (and with obvious periapical pathosis). Leaving the file is not a preferred option as it is short, does not provide seal, and there is a RL at the apex. Apicoectomy (surgically removing the last 5 mm of the root tip) is a possibility, but unfortunate and somewhat invasive Extraction is another option yet terrible. The last option was to attempt to retrieve the file--something I had never been successful in accomplishing. The Tulsa Dental Piezo Ultrasonic came in handy again (thanks for the donation)! After 30 minutes of using multiple non-surgical tips and different ultrasonic levels (5-15), water and no water, stil the file failed to come loose. All I knew about operating this instrument was to circle the file (which was not visible) in a counter-clockwise fashion. It didn't seem to be working. All that seemed to be happening was the removal of intracanal cementum and possibility of perforation. Persistence proved successful and the separated file in a swift movement was loosened and removed. The canal was shaped (somewhat overshaped in the coronal third). The canal was irrigated with NaOCL, dried, sealed with therma-seal, and obturated with thermafil GP. Decent fill with a "puff" of sealer extruded past the apex confirming patentcy. I'm grateful for an understanding patient and the chance to correct an iatrogenic event. I found interest in a recent podcast and wanted to share with you the introduction. Take a moment in your mind and answer the following questions. 1) Who is the living person who has had the greatest influence on your life? 3) What is God like? 4) What is "The Church"? 5) What is "The Church's" Gospel? 7) What is the meaning of life? Answers: All can be answered with the same word. 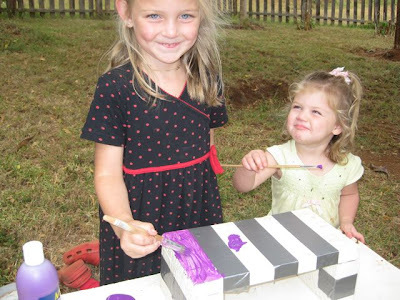 Amelia and Meredith have learned on their own how to make pottery here in Kenya. Inside their "bush fort" they mix mud and water together on a piece of lumber. 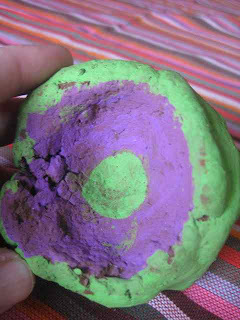 They form the bowl with their hands and other made up tools to their correct shape. Then they allow the mud to bake under the sun. Finally, adding some paint to finish their creation. One each for Mom & Dad. 25Anxiety in a man's heart weighs it down, but an encouraging word makes it glad. This proverb is particularly fitting for my heart which is often filled with anxiety. 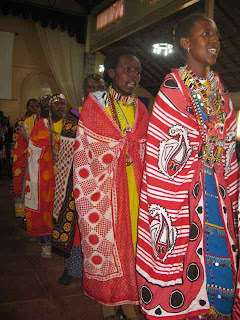 Our visit to Tenwek last weekend was more than a celebration it was encouragement. Being able to visit and pray with friends over work challenges, hearing thoughtful words from a general surgeon, getting 8 ounces of Tilamook Cheese as a gift, eating with other families, and spending time together as a family made my heart glad. But anxiety so easily creeps back as I returned to busy wards, sick patients, 2 babies dying during labor, trying to resolve interpersonal conflicts, complex surgeries.... but as I'm leaving today the main OR coordinator encouraged me. And yet, I know her day is filled with many demands as well. So I wonder, perhaps an anxious heart is also eased by encouraging others? After all if we can focus on others, rather than ourselves, then there should be less time for anxious thoughts and worry. 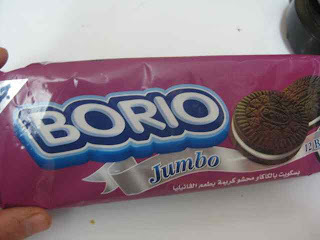 The "borio" cookies we found at Nakumat despite being jumbo size just didn't compare to the real thing. Nevertheless, Meredith licked out the frosting in the middle. 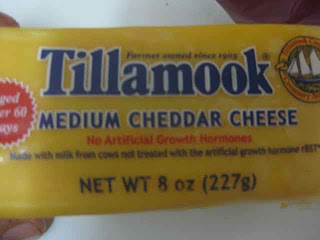 Friends from Tenwek that returned to Oregon recently thought of us and returned with Tillamook cheese straight from the factory. Thanks this little slice of Oregon is delicious! 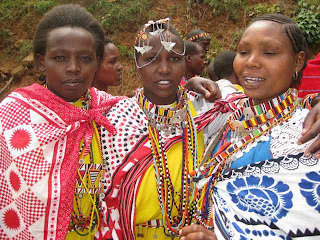 In an unexpected last minute move a holiday in Kenya was declared by the president today. A national census is occurring and census takers work late in the evening knocking on doors; hence people may need to rest the next day due to the late night interference. Non-emergent outpatient service were closed at Kijabe; so that meant some time extra time with Amelia & Meredith. Amelia would say, "I had a rough day. Daddy & Mommy gave Z the cat away again. I was at the park climbing the tree when they came to get him. This time I did not even get to say goodbye. Then I tripped and fell down the stairs." We don't expect Z to come back this time as they have taken him to the Kakamega Forest (roughly 400 km away). This is what Kenya (and a day with Dad) does to Meredith. 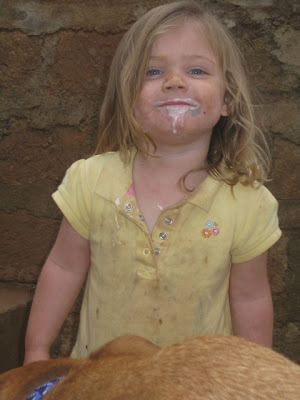 I think under the yoghurt on her face you would find dirt, then perhaps marker, and who knows what else. 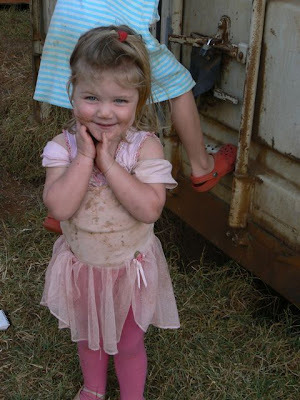 Sara and I and the girls made the 180 kilometer dusty drive to Tenwek Hospital to mark the 50th Anniversary of Compassionate Health Care, Spiritual Ministry and Training for Service. Although Tenwek Hospital has existed for nearly a century, it was only after 20 years of prayer by a dedicated nurse that in 1959 Dr. Ernie Steury the first full time physician arrived. 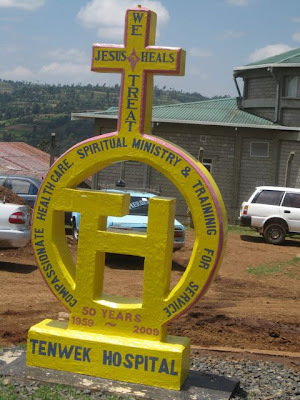 My how Tenwek Hospital has changed in the last century (Tenwek received its name because it took the first missionaries "Ten-weeks" to arrive from Mombassa). Now drivers go To Tenwek and back in 1 day. Mrs. Ernie Steury escorted by family. 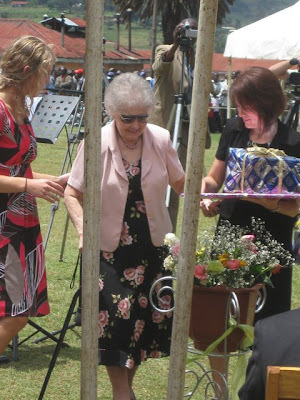 It was moving to see her greeted and thanked by Kipsigis patients of Dr. Steury (Mosonik) years ago. 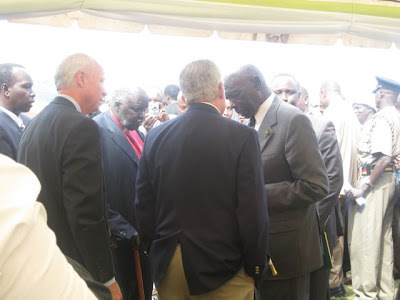 President Hubert of WGM, President David Stephens of CMDA, and former President of Kenya Daniel arap Moi were honored speakers at the celebration at nearby Tenwek secondary school. Several thousand people filled the soccer field to be a part of the celebration. Dr. Stephens reminded us that Tenwek was founded on principals of 1) prayer 2) striving for excellence 3) humility and 4) "keep the main thing, the main thing." (sharing the gospel). Tenwek's new fountain in the courtyard with clean water! 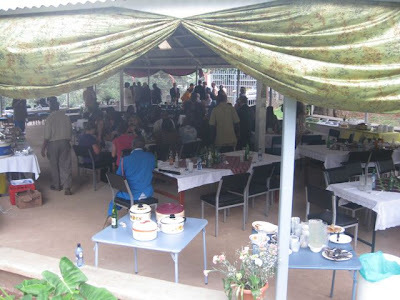 The Kipaganga as you have never seen it before with a catered dinner. With sometimes limited tests I'm not always sure what I'm getting into when a patient needs surgery. While this pushes my physical examination skills particularly since sometimes history is vague, I'm always amazed at the depth of pathology. So, if you want to look below is a small capture of some of the things I've been treating. What's more amazing though is the healing given by God to these lives. God's care and provision is revealed to these women through the healing and restoration of their health through surgery. I feel so privileged to work here! So, next time I post medical pictures I'll try to capture some of the adorable babies I also get to "remove" through C-sections! A place to find help. After receiving positive feedback from other health care professionals its seems appropriate and uplifting to share Simon's story of healing (Simon was welcoming of photographs). 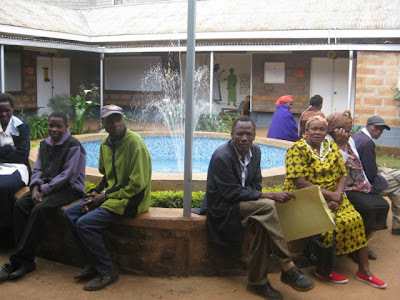 The best stories are that of our patients and their experiences at Kijabe. 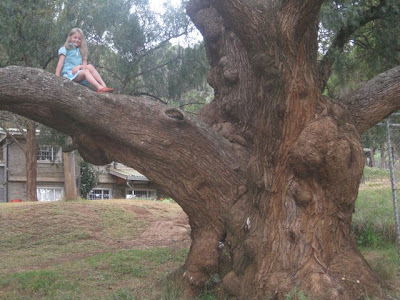 Simon came to Kijabe dental six weeks ago from a place just 20 km up the road. He is 29 years old, Kikuyu, and in good health. 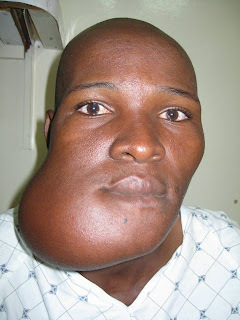 The painless swelling in his right cheek had grown steadily for 8 years to its present size. Beyond the obvious disfigurement it does not prevent Simon from eating or holding a normal job. It is firm to the touch. 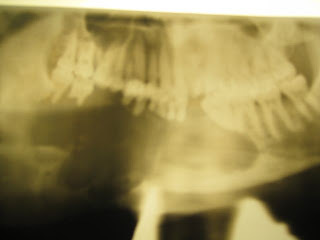 Intra-orally the mass had malpositioned, or avulsed or mobilized teeth #19-32. This intrabony swelling extended from the alveolar crest to the inferior border of the mandible. The swelling has pushed into the floor of the mouth pushing the tongue upwards. A natural question for myself and most any observer is, "How did Simon let this get this big?" Simon has been proactive about receiving treatment for the past two years. The process of receiving surgical care in Kenya can be long and convoluted starting at a small dispensary where you might see a nurse, referred to a sub-district hospital where you might see a clinical officer, to a district hospital where if you come the right day you might see a dentist, to a national hospital where you would find and oral maxillofacial surgeon. Eventually Simon was able to attain an OPG (x-ray) of his mandible and maxilla at a National Hospital. At this time he was given a prescription for a titanium mandibular replacement (much as you or I would be given a prescription for medicine). In Kenya it is common to receive a prescription and buy your artificial hip, or knee, or in this case mandible before surgery is allowed. Simon saved and raised nearly 80,000 (1,000 USD) to purchase the titanium replacement. His surgery was finally scheduled at a National Hospital. It was cancelled. It was rescheduled, and cancelled again. He was not rescheduled. At that time Simon came to Kijabe. 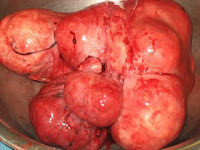 The incisional biopsy was completed at Kijabe and as we expected it came back positive for Ameloblastoma. 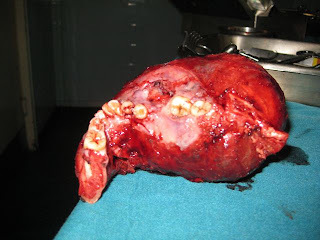 Ameloblastoma is a benign slow growing neoplasm that typically presents in the mandible in the third to fifth decade of life more commonly in men. Fortunately Ameloblastomas are treatable, but require aggressive surgical approach of partial mandibulectomy establishing clean margin of 1.0 cm past the radiographic extent of the lesion. This treatment is beyond the scope of my training and profession, but one of the benefits of missionary medicine is the chance to work alongside dedicated and talented Christian surgeons. 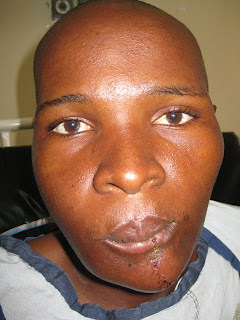 The 6 hour surgery involved a split lip incision extending below the chin and to the angle of the mandible. 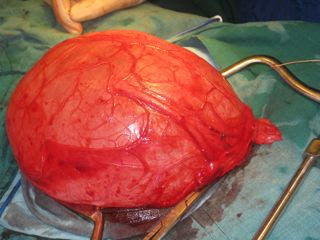 After this the tumor was disected away from the viable soft tissue. Finally the mandible was sectioned in the ramus on the right side and medial to the 3rd molar on the left side. Then a 10 inch segment of the fibula from the patient's left leg was harvest as a graft to replace the missing segment of the mandible. The fibular bone was sectioned 3 times to approximate the form of the mandibular ridge. Mini plates and bicortical screws were used to attach the fibular bone segments together and to the vital mandible. The periosteum, facial layers, and skin was closed and a drain was sutured into place. Simon was in the ICU several days after surgery mostly for access to urgent care if any airway issues arose. 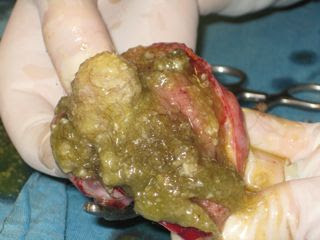 Unfortunately, since the surgery the wound in his mouth has dehisced twice exposing the graft. It has since been resutured. He is just recently discharged. 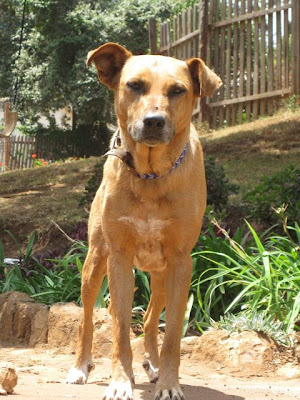 We are happy Simon found Kijabe, and that Kijabe was able to help him. We pray he continues to heal and the mandibular graft takes. The Post Residency Program of which we are part of under World Medical Mission and Samaritan's Purse is a young ministry. This two year program is less than 5 years old. It was developed in response to 1) a shortage of doctors to staff Christian mission hospitals around the globe and 2) to meet an anticipated future need as the average age of Christian mission doctors is over 50 years old. It was found that many obstacles prevented young physicians from considering missions including student loans, logistics support, and fund raising. How could a young physician transfer from residency to the mission field? The Post Residency program eases that transition for us in several ways. Logistical support is provided by our coordinator for travel, visas, licenses, etc. Financial support is provided by World Medical Mission for living expenses, travel, health insurance, medical licensing fees. Loan repayment was arranged through WMM via Project Med Send. Spiritually we are supported though prayer from the WMM staff, regular e-mail communication, and an upcoming retreat with other Post-Residents and their families in October. This ministry has grown from 1-2 post residents per year and blossomed to over 10 residents per year. Currently there are over 20 physicians serving in the PRP in specialties including ophthalmology, general surgery, pediatrics, infectious disease, orthopedics, etc. in countries from Honduras, China, Zambia, Niger, Afghanistan, Peru, and Papa New Guinea, etc. Although this new program occasionally trips and stumbles, I believe there is power when evangelism and healing come together. It is not a surprise that forces will try to thwart the good news and effectiveness of this young ministry. Just in the last week young physicians like ourselves have faced setbacks Car accidents, houses not selling, health difficulties with children, and robberies all seek to discourage and prevent doctors and their families from serving. We pray that God overcomes these obstacles and they are allowed to go, and those serving are safe to stay. This is Mocha our dog and fourth pet in addition to the fish (no name), Flower the bunny, and "Z" the cat. Mocha is female but that is about all we know about her. We don't know what breed she is or mix of more likely? We don't know how old she is (maybe between 9-13)? We don't know how many missionaries she has been through at this house? We also don't know how she manages to acquire one or two ticks per week. But Mocha is good to the girls. She licks up any food spilled by Meredith. She lets Amelia ride on her bak. Mocha will accompany Sara on walks and keep the other barking dogs away. Mocha to my delight chases Z up the tree keeping him out of the house. Mocha is suppose to be the house watch-dog as theft has been a minor problem in our location below the hospital. But I have yet to hear her bark at any one in the past two months. Usually she has this forlorn or tired look about her and spends most of the day lounging in the sun. Regardless, culturally Kenyans are quite scared of dogs and even security people will ask that we meet them at the gate for fear of "Mocha". Fellow post-resident Stephany (pediatrician), myself and a visiting anesthesiologist (Shannon, who took the picture) climbed Mt. Longonot today. 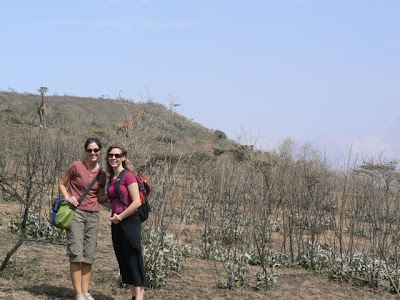 We enjoyed the 4 hour hike up to the crater and around. Along the way we saw giraffes (look behind us for 3 of them), dik-dik, antelope, zebra and many birds. I'm also grateful to be feeling completely better. The children also did some climbing as pictured below. I don't think the view was as spectacular, but they didn't seem to mind. 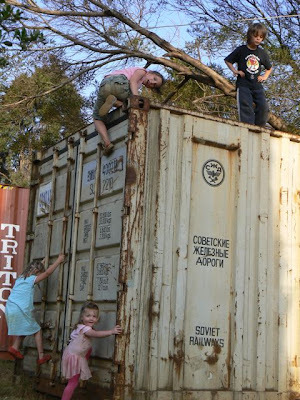 These containers are often used by career missionaries to ship their households to Africa. After being emptied they're used for storage or occasionally as a jungle gym. Meredith decided that she needed to climb as a ballerina and managed to spend the day in a leotard and tights. Below is the consequence of being an outdoor ballerina. Thank goodness we have warm water for the bath! 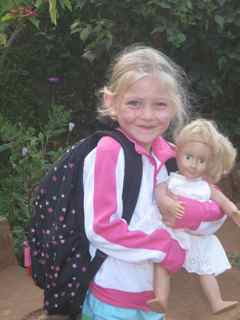 Amelia asked last night, "Mom, can you help me carry my doll like the Kenyans carry their babies?" So, we strapped "Jenny" to here back with a kiko and Meredith of course had to do the same. Our helper, Nancy, braided Amelia's hair last week. So, we've avoided for 10 days the tears that come with combing it. The girls enjoy living here. They've learned new things as have we. 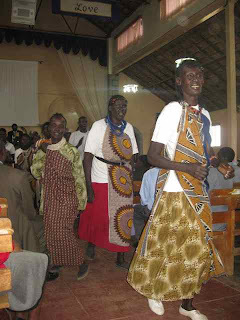 Some of what I've learned is different surgical procedures, Swahili, new praise songs at church, how to make Ugali, the treatment of many tropical diseases, but mostly what I'm learning about is how God loves people and provides. Over and over I see God's faithfulness and learn that God can be trusted. Trusted with the sick, my children, our careers, future plans and with all that concerns me, because ultimately God is most concerned about His creation. And God's love is truly unfathomable. The conversation with Charles my walk-in patient yesterday morning began like this. "Doctor, I need to tell you something. I usually don't tell many people this, but I've only brushed my teeth 6 times in my life. But I think I'm kind of fortunate. A doctor once told me I have the right kind of spittle to keep my teeth clean." Upon oral exam his dentition fairly reflected his "infrequent" oral hygiene habits showing many missing/decayed teeth and desperately in need of having his teeth cleaned. We first discussed perhaps trying to brush the teeth at least once a month if not once a week. He seemed agreeable to this idea. Before casting judgement, I got to know Charles. He is a 50 year old humanitarian from the United States. He has lived in Kenya many years and works with getting wheelchairs transported from the United States to Kenyans in need. He is been successful in obtaining several containers full of medical supplies and finding funds to have them shipped to Kenya, including two dental chairs. He plans to convert these 20 foot by 10 foot metal containers into a makeshift medical and dental clinic. Maybe we will together on a project some day. I was surprised indeed by the endeavors of this man. Amelia likes painting and just learned to draw a horse. She likes to jump rope while running and has two skinned knees to prove her accomplishment. Amelia wears dresses everyday. 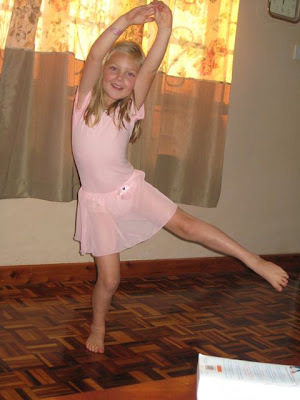 She is excited for upcoming ballet lessons and to wear her tutu and leg warmers. Her dreams are now to have her own horses (a white stallion), be a Mom when she grows up, and to grow her hair past her waist. Amelia lost two more lower incisors in the past week giving her an enormous gap in her smile. The tooth fairy came up with 200 shillings under her pillow even though Amelia was awake, "Daddy you are suppose to wait until I'm asleep." "Daddy you a Dentist, Mommy an obstetillian." "It's OK...I allowed to do it." "Z's a naughty cat. He's not good cat." "Flower.he has so sharp nails. I want get him out of bunny's cage." "Mommy at hospital...take care of babies." "I do it..I do it by myself." "Today is church day. I want sunday-school." Adjacent to the dental clinic at Kijabe this scene daily unfolds. 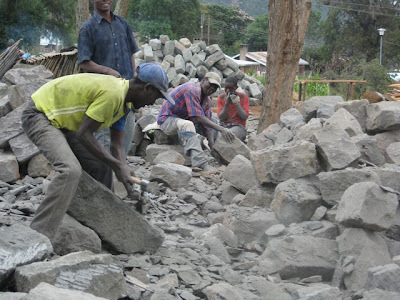 A group of 5 or so Kenyan men pick up their hammers and chisels. They begin shaping odd pieces of rock into rectangular bricks one by one. They are hired by the hospital. This is the way the new Theatre (5 Operating Rooms) are being built. I watch and wonder if they will ever finish this job and if the new OR's will ever be completed? I also wonder which one of these hand and chisel formed blocks will be the cornerstone? A cornerstone to a Mission Hospital operating room designed to heal the sick and afflicted? And, ultimately we ask who is our cornerstone? 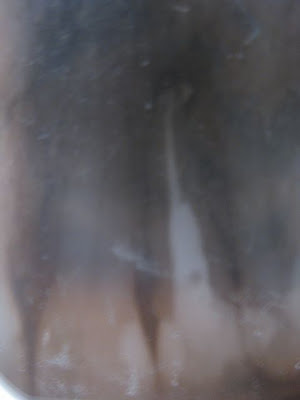 Looking at dental radiographs may be something that is of no interest to readers of this blog and if so please skip this entry. Yet I am aware of dental professionals that read this blog and might find this case of interest. I personally find it quite remarkable and beyond my imagination that it could be accomplished in rural Africa; but I understand if your interest does not match my own. This patient a 56 year old Kenyan male physiology teacher came to me with a loose crown on tooth #8 (or 1-1 pr Kenyan numbering system). 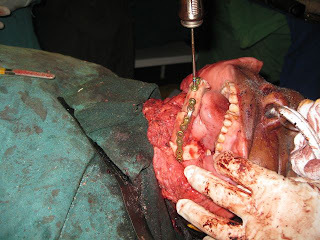 He had a healthy dentition and was willing to attempt anything to keep his tooth and refrain from moving towards a denture or implant (not currently available at Kijabe). 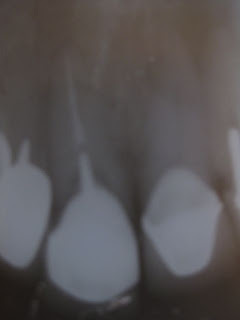 The patient had the crown and post placed on tooth #8 about 15 years previous. 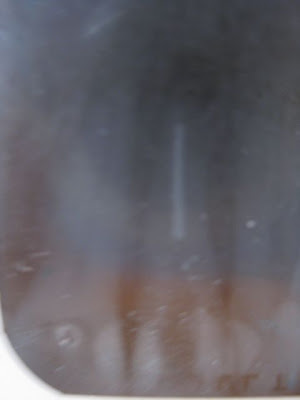 The tooth was asymptomatic beyond the crown being loose. You can see from the x-ray a radiolucency around the margins of the crown (reoccurent decay) and a post that is short, 3 mm long (10-15 mm is ideal or to within about 5 mm of the apex). Our plan included removal of the PFM crown #8. 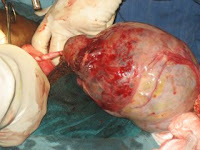 Removal of the post without perforation or fracture of the root. Removal of the Gutta Percha to within 5 mm of the apex. Shaping the canal appropriately for post placement. Placement and cementation of a new para-post. Fabrication of new PFM crown. Below you will see the progress that was made. The PFM crown was loose and easily removed. Patient was anesthetized with Septocaine. The decay was 360 around the CEJ of the tooth and subgingival. It was removed with SS burr. The Post was lightly vibrated out of the canal with the Pro-Ultrasonic Piezo Electric Unit (thanks to a generous donation from Tulsa Dental). The GP was removed with the Tulsa Dental Rotary Gutta Percha removal files to within 5 mm of the apex. The canal was prepared for a post with the red parallel post rotary drills. A red para-post was placed and cemented with max cement. The core was built up with core composite material and cured. 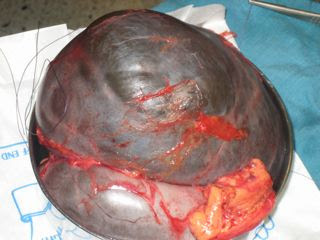 Gingival Retraction cord was placed x2 and hemodent was used in addition to attain a dry field for impression. Light body and Heavy Body PVS impression material was used for a final impression using a quick bite tray. The tooth was temporized with a prefabricated acyclic crown and lined with trim. Cemented with dycal. The patient returned in two weeks. The crown was fabricated and a dental laboratory in Nairobi. Margins, occlusion, and fit was checked and the crown was cemented with GIC. The patient was well pleased with the shape, shade, and function of his newly restored smile. We talked at length about how pleased he is to come to Kijabe Mission Hospital for dental and medical care. I don't believe that he is a man of faith yet he described this hospital as a placed filled with "heroes." He said the "nurses and doctors go beyond the normal care. They are courageous, talented, and dedicated." 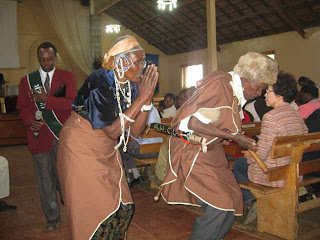 Perhaps a small recognition that Kijabe exists to go beyond physical care, but also to allow the divine to find a presence in his life. 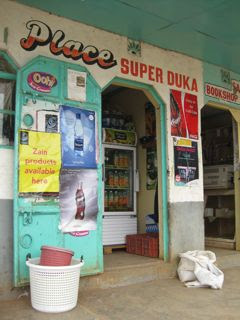 The "Super Duka" is our local grocery store. With Nairobi 45 minutes to an hour away, the Super Duka gets us by in between trips. Looking inside you'll see plum jam, margarine, bread, rice, tea, coffee, spices, flour, sugar and assortment of fruit punches and sodas. The back contains eggs and the freezer has some ice cream, occasionally bacon, and cheese. 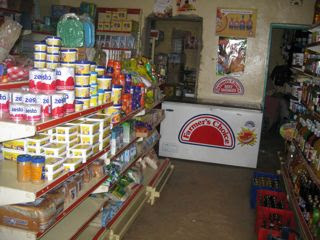 It's amazing how many meals can be made from these ingredients plus some local fruits and vegetables. The owner caters to the many visiting physician staff and teachers here, so there's often yogurt, cottage cheese and coke light. 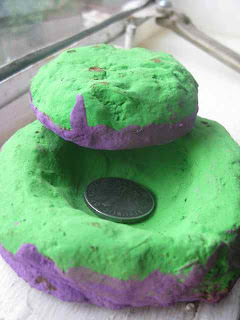 Meredith loves to come here, because we usually get her a piece of gum... which costs about a penny. 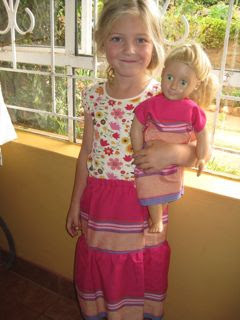 This skirt and matching doll outfit was made my a mom at Kijabe out of kiko, a common fabric here. Amelia just adores them! 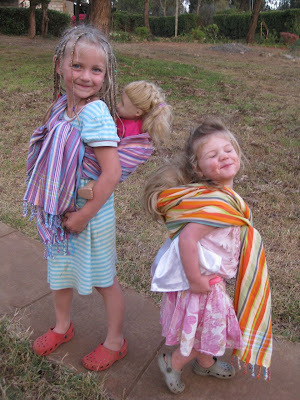 In fact, all the girls pictured below have skirts with matching dresses for their dolls. 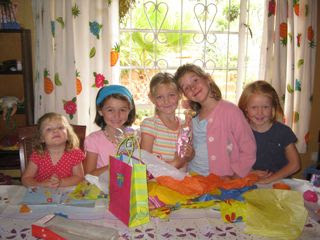 It's a strange sort of blessing, but none the less we're grateful there's a group of girls always ready to play dolls. While grateful that I am recovering from what seems to be some-type of Salmonella (possibly Typhoid type), I want to wake-up and just be better. In fact, for most things I like immediate results. Those of you that know me well, know that patience is something I struggle with. So even while being sick I get impatient with healing. Perhaps that's why I love the stories of miraculous healing---they're instantaneous. It's also why I love cooking & baking: you put things together to get an immediate result. And maybe even this impatience compels me to fold the laundry into organized items as soon as the basket is full. However it also makes it hard for me to delegate tasks and yet this week I've been forced to entrust the care of many patients to other physicians. Then as I start to worry about what is happening on the ward, in the theatre (OR), in casualty (ER), with the lectures I'm supposed to be giving, I'm reminded God cares for these patients and will provide. God's patience in teaching me not to worry thankfully is unending. Because I seem to need to be reminded of that daily. While I've not recovered yet, the abdominal pain has reduced. And I hope that means the rest of my symptoms will go away soon. Thank you to all who are praying; particularly for the prayers that the rest of the family stays healthy! Sara woke this morning feeling even sicker than yesterday. She felt too weak to even go down the stairs to the kitchen. Her headache has kept her head on a pillow and a hand on her forehead all day. She is having painful stomach cramps and can not eat..just taking liquids with her medicine. She has continued with the malaria treatment, but we are still uncertain if that is the cause of her illness. In Africa there are so many basic illnesses that can affect us. We are thankful at times like this for the other medical professionals around. They have started her on cipro and an anti-nausea medication. We pray tomorrow Sara is improved. You can be praying for Sara as she has been sick the past 4 days. She has had fever, chills, stomach pain, no appetite, fatigue, and a pounding/pounding headache. The last several days for her have been spent in bed trying to keep warm. She has gone in to the hospital when needed for emergent hysterectomies, consults, and to round but then comes home completely depleted. All her elective cases in Theatre were cancelled today. She saw a doctor today and had a malaria smear taken. The results were negative. But they often come back negative. Her doctor recommended taking the malaria medication regardless. Malaria is rare at Kijabe as mosquitos are nearly absent. We pray she starts feeling better soon. Blood is a precious commodity here. Negative blood groups are rare, so often blood is unavailable for Rh negative patients. Patients scheduled for elective surgery must come with family/friends to donate blood prior to surgery. Staff members are often called upon to donate. And since HIV and anemia are common, many people are ineligible to donate. Yesterday a patient arrived hemorrhaging that we took for C/S. 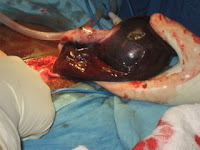 The baby just 24 weeks old had already passed, and despite our best efforts the uterus would not contract, continued to bleed and I decided to proceed with hysterectomy. The patient, while physically will recover, emotionally she is distraught. She had miscarried twice and had a baby that lived 3 weeks before dying, now she will never be pregnant again. Even her husband couldn't stop his grief which it has been very rare to see men cry here. Still he went to lab to donate blood for his wife. His blood helped heal her, but now she needs Christ's blood to redeem her. Later that night, I was asked to come help with another bleeding patient. This woman had already delivered. By the time I was called her blood loss was close to 3 liters and she had gone into DIC (a disorder where the things that should help the body stop bleeding quit working). Believing she was too sick for surgery, I decided to try a technique I'd read about using foley catheters to tamponade the uterine bleeding. We sent the intern to donate his blood for the patient because we really needed fresh blood and none was available. The lab sent him back saying they didn't have time to prepare fresh blood at night. Thankfully the doctor, who asked me to help him, went to lab to persuade them that all other tests could wait until we took care of this patient. 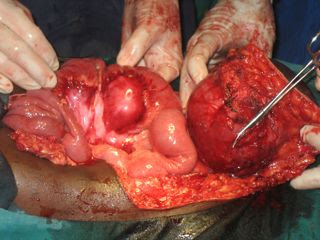 As we waited for his blood we prayed for this patient and slowly the bleeding reduced. I don't know if it was the catheters, medicines, blood, or the Lord that stopped the bleeding. But if you saw the pool of blood I was wading in you would have to agree that her survival was miraculously. Seeing her this morning, still on a ventilator, but alert, I told her she survived out of God's goodness. With tears in her eyes, she grabbed my hand in agreement. As Malin wrote I've been sick and yet needed at the hospital. Somehow the strength was given to care for these patients, and a few others. But now I need God's healing touch because there's a lot more work to be done. Amelia's birthday (July 26th) brought many wonderful packages to our house. And some stuff is still coming. Since she has received her ballet outfit from Grammie she wants to wear it constantly and dance around the house. One advantage to being at one of the largest mission stations in the world with an incredible school is that parents arrange many activities for all the kids. Next fall this will include ballet lessons for all the little girls on station. Amelia is counting down the days. 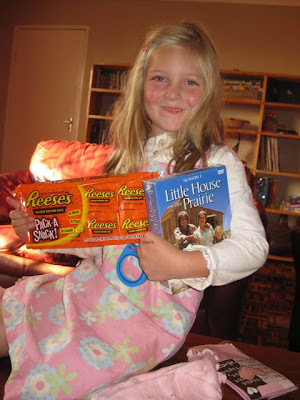 She is also sparingly eating her favorite candy Reese's cups. We've enjoyed watching Little House on the Prairie at night and reading "In Grandmother's Attic." For those of you with little girls this show and book have such wonderful lessons/morals. Amelia just adores them. She is also very excited to have her friends over today for a party. Imagine our concern last night as we heard a familiar meowing at our door. Amelia ran outside and proudly announced, "Zee's back. I think it's because he loves me." Indeed the cat was back. Amelia thought it was just like Homeward Bound. We're deciding how far away we'll have to drive Zee to keep him out of our house, from scratching Meredith as she eats dinner, and from hissing at Amelia as she tries to pet him. Meredith suggested he come to Nana and Papa's house when we go for my brother's wedding. This seemed reasonable since I'm sure the cat won't be able to swim the Atlantic Ocean, but I think we'll try dropping him off in Nairobi first. Dr. Warren Cooper is a Christian surgeon we met in Boone, North Carolina during the course of our orientation with Samaritan's Purse in preparation for our departure to serve in Kenya with the Post-Residency Program. He is employed on special assignment with SP as a surgeon who visits mission hospitals to serve, encourage, and evaluate medical needs. Dr. Cooper shared this message "One at a time" with the post-residents and has allowed me to share it with you. It is relevant to Sara and I as we serve patients one by one in Kenya and occasionally wonder are we making a difference. The population of Kenya is over 30 million and we can't begin to touch that many people. I think the message has broader implications to any in professions, volunteer activities, or in relationships that make contact with people one at a time. Please read Dr. Coopers message. resources, this is certainly more cost-effective. As a clinician, one can start to wonder what the practical significance of treating one person is. There are so many people out there. One person is only a drop in the bucket, a speck in the sea of misery. global disease burden and maximize DALY’s (disability-adjusted life years) would be much greater by directing available resources toward the care of the child. It would be like stopping an ambulance to help someone in a wheelchair. Jesus did not see things that way. He saw before him, in this bundle of rags, a person of inestimable value. He saw not only a body, but a soul that had suffered and was in need of healing. In reality, the physical healing had already taken place. He could have been content that she was healed in her body, and rushed on to the real emergency, but he stops and makes contact. The disciples were annoyed. The synagogue leader was probably beside himself. Everyone was wondering why he was wasting his time, but Jesus stops and talks with the woman. He treats her with compassion and offers her the spiritual healing which she needed the most of all. In the meantime, the unthinkable happens. The child dies, perhaps as a result of the delay. It is a tragic outcome, but even then we see that God has the ability to work through the situation. When everyone has given up, He goes to the house of mourning and brings the dead girl back to life. It is a healing of unbelief as much as a physical healing. Even when there is no reason to hope, we see that miracles happen and that God can work through the most terrible tragedy to bring glory to Himself. forgiveness. This thought can give perspective as you look out at the impossible operative schedule, the ward full of disasters or the jam-packed clinic that you’ll never get through. The person in front of you is everything. Some people will go to extreme lengths to avoid mosquito bites. They'll wear long sleeves and pants in the heat of summer, surround themselves with citronella candles and torches, and spray foul-smelling chemicals all over their bodies--or simply not set foot outside when they know the bugs are biting. Stephen Hoffman isn't quite like those people. In fact, he has gone out of his way to get bitten. Years ago, he let 2,000 mosquitoes feast on his arm and inject perhaps 200,000 parasites into his bloodstream. Why? Well, for one thing, it made him immune to malaria. He's also the CEO of Sanaria, a Rockville, Md.-based company that aims to develop and commercialize a malaria vaccine. But he doesn't plan on subjecting all of us to as many bites as he has suffered. Receiving the vaccine that Hoffman hopes to create, in fact, wouldn't involve any mosquito bites at all. "It would have to be delivered by needle and syringe," he says. Creating the vaccine is another matter, however, and it calls for more brave volunteers willing to serve as mosquito fodder. Progress toward a malaria vaccine, including a major new advance that European scientists reported this week, has already demanded a blood sacrifice from hundreds of people. Some, like Hoffman, have had scientific reasons for getting involved. Others have been regular citizens with good initial health, a tolerance for inconvenience and risk, and perhaps either a deep sense of altruism or an acute need for cash. The 15 volunteers in the new European study, most of whom were students at Radboud University in the Netherlands, got paid 1,500 euros (about $2,100) in compensation. Ten of them also gained immunity to malaria, through the infected mosquito bites they got. The other five, assigned to a control group that didn't develop immunity, came down with bad cases of the parasitic disease. "The control group got full-blown malaria," says study leader Robert Sauerwein, a medical microbiologist atRadboud University Nijmegen Medical Center. "They got grade 3, quite severe symptoms." While Hoffman didn't participate in that study, he too has developed malaria in the line of duty. It happened in the late 1980s when an early immunization effort he was testing on himself failed to work. Not knowing he was unprotected, he let five infected mosquitoes bite him--and came down with symptoms. In the subsequent trial, where he received bites from 2,000 mosquitoes, the bugs had first been zapped with radiation to weaken the parasites. Hoffman's and Sauerwein's teams are now collaborating on malaria vaccine development, and they have the backing of some deep-pocketed sponsors, including two global health organizations supported by the Bill and Melinda Gates Foundation. But all the money in the world can't prove that a vaccine works unless a few folks are willing to play guinea pig. That's why volunteers are so important, the researchers say. "Almost 1,400 volunteers have been exposed to malaria in the context of vaccine development," Sauerwein says. (He adds that tens of thousands of other people willingly got malaria--as a therapy for syphilis--from the 1920s through the 1950s. But that's another story.) Sauerwein and his colleagues recruited their group of volunteers by publishing informational leaflets and advertising the trial around campus. They gave curious respondents a short interview, then sent them more details about the study and invited them to a series of "information evenings" that featured slide shows and additional explanations of the study. After all that, Sauerwein says, "we had about...45 people who really wanted to participate." A thoroughmedical checkup and psychological evaluation disqualified some of them, leaving about 25 qualified volunteers, from which they selected the 15. "You have to have an absolutely blank medical history," he says. For scientific and ethical reasons, his team turned down people with asthma, for example, and those who had abnormal psychological profiles or seemed to have a financial neediness that might make them willing to take undue risks with their health. During the study itself, the final squad of 15 took the antimalaria drug chloroquine while being exposed on three occasions to bites from a dozen or more mosquitoes. While 10 of the volunteers fed malaria-infected mosquitoes, the chloroquine protected them from getting sick. Meanwhile, the exposure trained their immune systems to kill the parasite. So when these volunteers were exposed to a fourth round of mosquito bites after they'd stopped taking chloroquine, they stayed healthy. The mosquitoes that bit the other volunteers weren't carrying malaria, which is why those five people didn't develop immunity. Sauerwein's team reported their findings in Thursday's issue of the New England Journal of Medicine. Aside from the risk of getting sick, volunteering has several drawbacks, including inconvenience and the discomfort of being subjected to numerous medical tests. "Participation is quite time-consuming," Sauerwein says. Over the course of the five-month study, each volunteer had to visit the medical research facility about 50 times. Toward the end of the study, when volunteers had to be closely monitored because they were most likely to come down with malaria, "they had to appear three times a day for two weeks or so," he says. So why did people step forward? Sauerwein says many of the selected volunteers expressed idealism, a sense that a malaria vaccine would represent an important achievement for human health worldwide. Some had personal or academic connections to countries where the disease is endemic, he adds. Malaria kills nearly 1 million people each year, most of them children in Africa. Hoffman, the head of Sanaria, had additional reasons for stepping up to the plate. "It was most appropriate for me to volunteer," he says. "We were studying the first vaccine.... If I wasn't willing to volunteer, how could I ask someone else to volunteer?" "I suppose," he adds, "I also wanted to be able to say I'm one of the handful of people in the entire world that is totally protected against malaria."